When tooling is of high quality, manufactured parts reap significant benefits. The quality of the finished part improves; faster manufacturing speeds are possible; and extremely repeatable processes enable high-volume production. For Magtrol, a leading manufacturer of motor testing equipment and hysteresis brakes and clutches, the need to revamp tooling processes for two different product groups—timing disks and diaphragms—was clear. That’s where Switzer’s tooling and manufacturing services came in handy. Timing disks are part of a larger system that measures torque speed and power. These disks are used to test small motors, known as dynamometers, and help determine what their speed is. Diaphragms, meanwhile, are incorporated into a small product called a friction unit—a component that is used in applications such as helicopters. The units create a spring action where two energized plates coupled together are able to return to their natural position when de-energized. For both of these product groups, the tooling and manufacturing had been around for about 20 years and was starting to reach the end of its life. By working with Switzer, Magtrol was able to save a tremendous amount of money by not having to create new tooling in-house for both of these products. Instead, the company was able to allocate time and money to other pressing items in their queue. That’s what led the company to work with Switzer on another recent project: a series of simple washers used for spacing in different units. It was once the case where all elements of these simple washers were made in-house via a stamping process. But the issue was that these parts could not be stamped without resulting in sharp edges and edges that would stick up. This, in turn, caused problems at the next stage of the assembly. Shifting from a stamping process to a chemical etching process completely eliminated several deburring steps in the plant. Chemical etching also allowed for the several different thicknesses required without having to purchase massive amounts of material. The company was able to achieve faster assemblies and produce much cleaner parts with optimized performance. Interested in learning more about the value of chemical etching in metal parts fabrication? 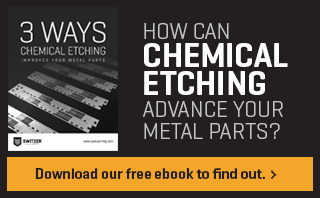 Get a free copy of our ebook, 3 Ways Chemical Etching Improves Your Metal Parts.